Coriandrum sativum. Full Sun to Partial Shade. Hardy Self-Sowing Annual. Height: up to 20” Width: up to 8”. Cilantro, also known as coriander, is in the parsley family. 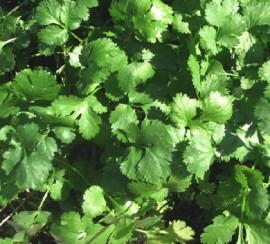 The base leaves are broad, similar to Italian parsley, and are reputed for the better flavor. It creates a rosette of lacy leaves in cool weather, then as weather warms, the plant sends up a long, lanky flower stalk that bears flat umbels of white or pinkish blossoms which later produce coriander seeds. Cilantro is a cooler weather plant and will not tolerate the hot summer months in Texas. It can take the full sun in the cooler months and prefers well drained soil. When harvesting your cilantro, trim your plant about one inch about the ground to promote new growth. Harvesting too low will damage the tap root of the plant. In order to harvest the coriander seeds you must let the plant grow out until it produces white flowers. When the flowers dry out you can harvest them and gather your coriander seeds from the dried flower heads. Cilantro and coriander are two terms that are easily confused. Cilantro is the name of the plant and it produces aromatic seeds called coriander. Cilantro has a pungent citrusy aroma and taste. It is often used in Asian, Middle Eastern, and Latin American cuisine. The leaves of cilantro are primarily used as a fresh ingredient whereas the coriander seeds are used when cooking or baking. Use the leaves to add flavor to salsas, soups, salads, and beans.